Wow! 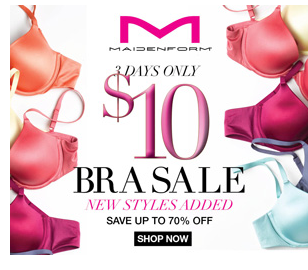 From now until 3/12/13, Maidenform has select bras priced at just $10 each. (some are regularly priced as high as $30!) That alone is a great deal, BUT you can stack two promo codes to maximize your savings! Enter code COUPSCP13 to take off 10%. Also use code SLKDEALFS13 to score FREE shipping! TIP: If you have problems, do NOT copy/paste the codes. Manually type them in.